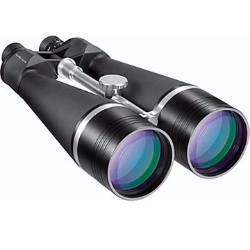 I have a question about which binoculars to buy. The main purpose, is long range scanning of the hill on the opposite side of the loch, which is about a mile away and the mountains behind the house. 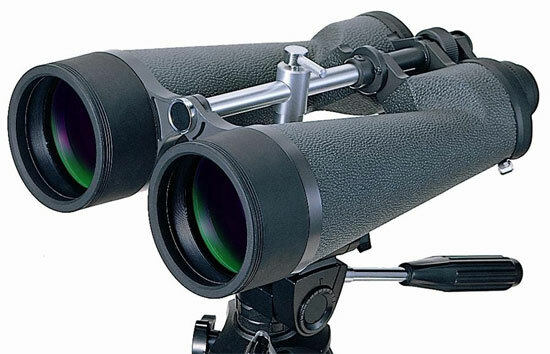 I have an old pair of Zeiss Dialyt 10x40B which are wonderful but I would like a really good set of long range binoculars that zoom in more and allow me to see further. I was told that the first figure is the magnification so should be much better than the Zeiss by a friend who gave me a pair of Bushnell 20x40 that they bought in 2006. They are rubbish! can't really get them setup properly and when they are as good as they get the view looks the same from them as it does with the Zeiss which are a breeze to use. Any advice and or suggestions for long distance viewing would be really appreciated. I think you website is a fantastic source of information and I would really appreciate your opinion on a pair of high power binoculars. I already have 2 average/good quality compact binoculars (10 x 25) and would like something a bit more powerful (say) around 12-15x or possibly up to 20x. Brightness, optical & build quality is important and my budget upper limit would be approx USD400. I live on the coast in Australia and can view migrating whales from my house. They are usually 2,000-5,000m away with most being 3,000m. I am interested in seeing the whales as closely as possible without needing a tripod although the ability to use them with a tripod is desirable. The new binoculars would primarily be used at home and we would use our existing compact ones when we are walking. Can you please advise on some suitable standard long range binoculars and also whether I should also be considering more powerful IS ones? Any help would be greatly appreciated. Firstly your friend is right in saying when describing a binocular, the first number is the magnification, so your Zeiss Dialyt 10x40B has a magnification of 10x, whilst the Bushnell 20x40 will magnify the image a massive 20x. If you need more info on this, take a look at my page on What To Look For When Buying Binoculars that includes a section explaining all about what the numbers mean. Many people make the mistake of assuming that in all cases and for all uses, a larger magnification or more powerful binoculars will be "much better" than those with lesser powers. I am not surprised that the 20x40 Bushnell's that your friend gave you were difficult to use as they produce a shaft of light that exits they eyepiece (exit-pupil) that is only 2mm in diameter (40 ÷ 20 = 2mm). Whereas if you take the Zeiss Dialyt 10x40B as another example, they produce a much more respectable 4mm exit pupil (40 ÷ 10 = 4mm) which will be larger than your eyes pupils in good light. What this means is that not only is the Bushnell transmitting less light to your eyes than those like your Zeiss binoculars that have larger exit pupils and so will appear less bright. But it makes lining up your pupils with those very small (2mm) shafts of light much more difficult than ones that produce larger shafts of light (larger exit pupils). If you do not line up your eyes with this light, you get dark rings forming around the image and it generally makes viewing and thus using the bins more difficult. For more on this very important concept, please take a moment to read my guide to the exit-pupil. By simply increasing the magnification on a binocular and nothing else, the exit pupil will get smaller and smaller. Larger lenses have the potential to capture and let in more light and therefore create a larger exit pupil, which we have already discovered means they can deliver more light to your eyes. So if for example you kept the 20x power, but with objectives twice the size (80mm), they would now produce a shaft of light that is 4mm in diameter (80 ÷ 20 = 4mm), which is much more reasonable and in fact is the same as your 10x40 Zeiss. The main down side to this is as you increase the objective lenses, the larger and heavier the bins become. 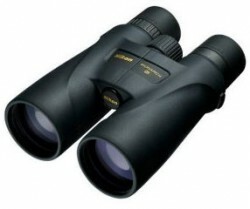 A typical 20x80 binocular will weigh around 2kg (4.4 pounds/ 70.4oz) and so can be quite difficult or even impossible to hold steady for a reasonable amount of time. To counter this, you should mount them onto a tripod, which will also ensure image stability. Another important aspect which I will get to a little later on. Almost all giant binoculars come with integrated tripod adapters that make attaching them to your tripod very simple - for more, see the section on tripods below. Whilst powerful binoculars give you more image detail, another down side to increasing the magnification is that it reduces the field of view (FOV). Or to put it more simply the width of the image that you can see gets narrower. This can make locating and following an object more difficult and is also not ideal if you want to scan over a wide area in search of something as at any point you are viewing a smaller area than you would with a bin that has a wider FOV. If we consider that most full sized 10x42 binoculars have a FOV of between 300ft and 350ft wide at a distance of 1000ft, you can see that the FOV of the much higher powered bins I have listed below is greatly reduced. As the magnification of an optical instrument is increased, any movement you make is amplified even more and so it makes keeping the image steadier more and more difficult. For hand held devices you really do not want to go much above 15x - 16x. So whilst it is possible to hand hold a binocular at higher magnifications, the constant image shake will make it hard to get a good view of whatever you are trying to observe, especially over longer periods and so you may find that you need to support the bin against a post or tree. So if you want to use a high powered long range binocular, you really should attach them to a good tripod via a tripod adapter. Fortunately most giant binoculars and many larger bins will come with integrated tripod adapters that makes them really simple to fix securely onto your tripod and even if they don't they are an easy to find and relatively cheap accessory to purchase. If you are wondering which to get, I personally use this Vanguard Alta Pro 263AT Tripod that I highly recommend, but there are many, many others that I am sure will work just as well. 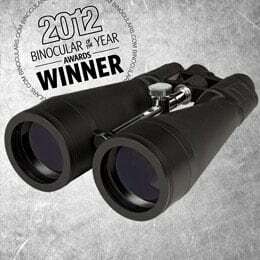 The excellent range Canon IS Binoculars, use electronics to stabilise the image which works really well. On the down side, the added electronics makes these a little heavier and more costly than optical only devices. If you are looking for a good value mid-to-high level, very powerful, long distance viewing binocular that can be used for astronomy as well as daytime terrestrial observation, then my top recommendation is the 25x100 Orion GiantView. The massive 25x power is great, but the fact that it is combined with the giant 100mm objectives ensure that not only do you get a very detailed "zoomed in" view, but it remains bright , even in very low light conditions, or indeed at night when using these for stargazing. Unlike some that only have the outer lenses treated, the optics on these are Fully Multi-Coated, this means that every lens surface throughout the optical system has multiple coatings of anti-reflection material added to them. This makes a real improvement to both brightness and image quality because far less light is reflected away each time it has to go through a lens in the system before getting to your eyes. Price - There are few low cost options available, which I have listed below, but just remember that in life you usually get what you pay for. So whilst they will be better than not using any binoculars at all, generally the more you pay, the better quality prisms, lenses and optical coatings are used, which will all go a long way to improving the overall quality of the image that you see and so the best long distance binoculars also tend to be the more expensive options. Hand Held Options: The 50mm to 60mm recommendations listed below may not have the longest range, but are for many uses ideal for those who are want a higher magnification binocular, but don't necessarily want to have to attach it to a tripod. Note: Almost all will still be tripod adaptable, giving you the flexibility to use them as you wish depending on the circumstance. Indeed just how much detail that you can see in your image will be greatly affected by how steady you can keep it still. However I have found that with a something like a 15x56 or 16x50, I am perfectly able to keep them steady enough with just my hands. So for example it may be nice to have them permanently set-up on a balcony looking out to the ocean on a tripod and then if you wish to take them out with you, just remove them from the tripod and off you go. I found hand holding them and keeping the image steady no problem at all, yet as they are easily fitted to a tripod, should you wish. On top of this, they have a quick-release neck strap system that makes it real easy to quickly swap them over to a over to a binocular harness. These would be perfect for medium to long range security surveillance, wildlife observation and even birding at longer distances like on the coast where the birds are usually a little further away. At around around $1000 / £1000, (check for the current prices in the US, UK as well as other countries by following the links below) the 15x56 Steiner HX is not the cheapest option on this page, but make no mistake, these are really up there with the best in this category and do in my opinion still offer great value for money. The size and weight is not so great as to make them too awkward to use for long periods and the slightly reduced magnification of 16x makes it much easier to keep the image still without the aid of a tripod. The XCF is their higher end product in this size configuration and uses Pentax's Super Multi-Coating for an improved light transmission. Note: Whilst they don't come with a tripod adapter included, they are tripod adaptable. This is the cheap option, but still use Porro Prisms made from BaK-4 glass and have Fully Multi-coated Optics which is good news. As I mentioned earlier, both Nikon and Pentax have a number of different options within the 16x50 configuration ranging in price from around $80 up to $200 in the US and £80 - £200 in the UK. 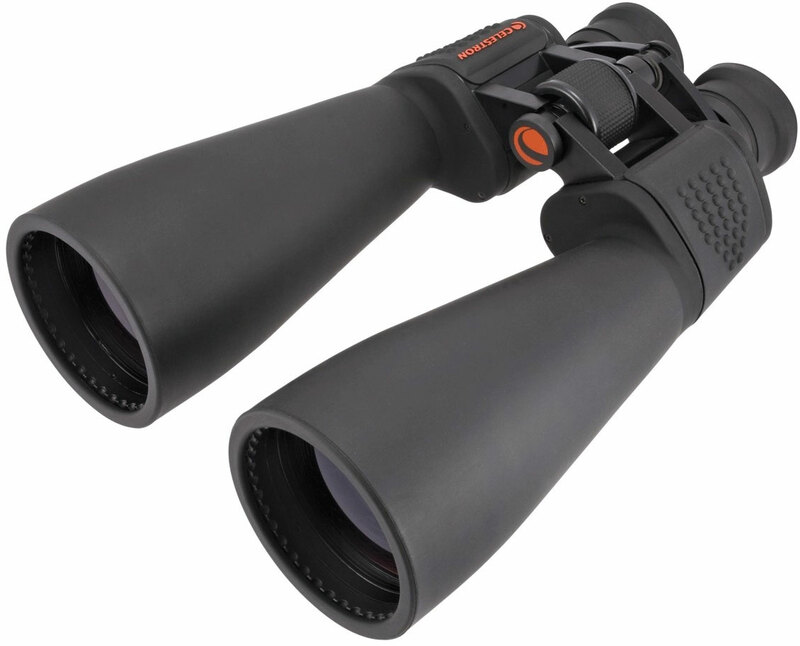 The 25x70mm Celestron SkyMaster binoculars combine a very high powered 25x magnification with large 70mm objective lenses and whilst the can be attached to a tripod for the most stable views, they are just light and small enough for most people to be able to hand hold them. The FOV on these is 141 wide @ 1000 yards (47m @ 1000m), which for a binocular with such a high power is pretty impressive. Read My Full Review for all the details on what I believe is a great low cost long distance binocular for use during the day and a good astronomy binocular at night. At the time of writing, the Celestron SkyMaster 25x70 Binoculars were available for around $90 in the US and £80 in the UK, which makes them great value for money. 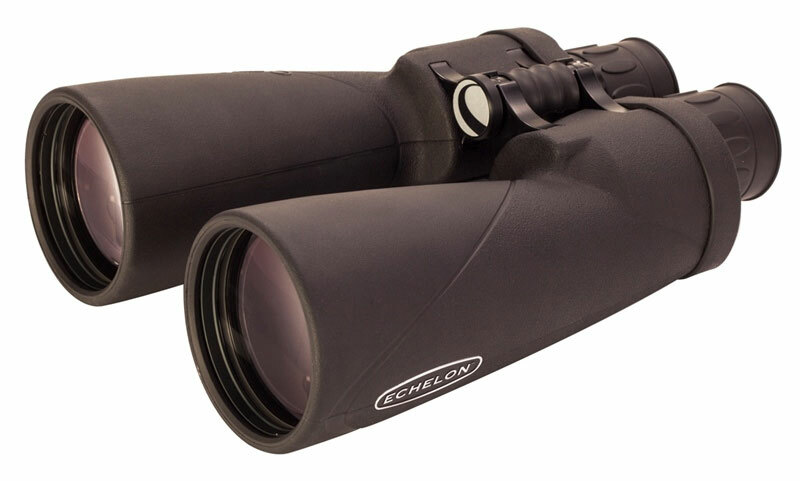 This award winning Echelon is similar to that of the SkyMaster above, except where the SkyMaster focuses on being great value for money, the Echelon's main aim is simply to be the best and indeed these are up there with the best long distance binoculars that I have tested. All Celestron Echelon binoculars are put together by hand in the USA, but they use the best optical components imported from Japan, thus combining a very high build quality with exceptional quality glass and coatings, to produce a stunning instrument. Scoring an "outstanding" 82% when I reviewed them they performed well above average in every department. Highlights include a full water and fog proof aluminium tripod adaptable body, BaK-4 porro prisms and Fully Multi Coated optics. 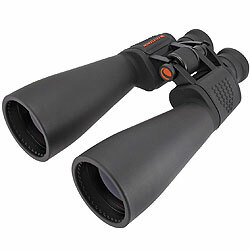 Whilst these 20x binoculars are not quite as powerful as the SkyMaster above, but the advantages being that you get a bigger exit pupil, for a much better low light performance and a wider field of view: The FOV on these is 157 wide @ 1000 yards (52m @ 1000m). For more details, please take time to Read My Full Review of this exceptional instrument. Costing around $800 in the US, they are not the cheapest, but when you consider the additional quality, I do still believe they make good value for the discerning long distance observer. 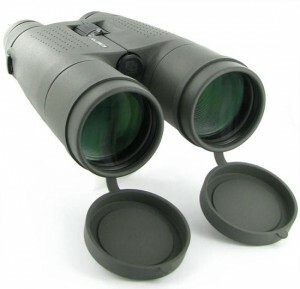 These high powered long distance binoculars with their 60mm objectives have a exit pupil of 3mm, which should be just enough for day time observation. They also use Pentax's Super Multi Coated lenses to increase the transmission levels to around 98%, which will help with image brightness. 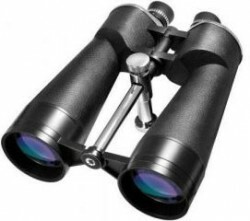 They weigh 3.09lb / 1.40 kg, which is a lot lighter than the larger 80mm binoculars listed below and so is possible to hand hold. However to keep the image completely steady over longer periods you may need to use something like a post or a tree if you don't want to use a tripod. The FOV on these is only 114ft wide @ 1000 yards (38m @ 1000m), which may be a consideration if you need to scan large areas. 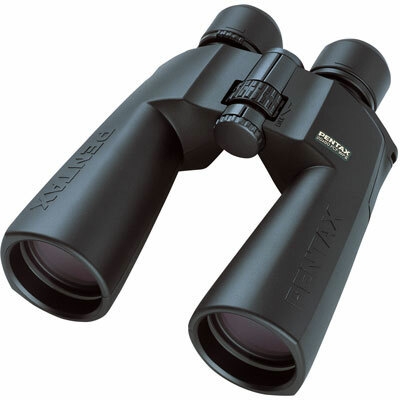 The Pentax 20x60 PCF WP II Binoculars cost about $200 in the US and £220 - £300 in the UK. 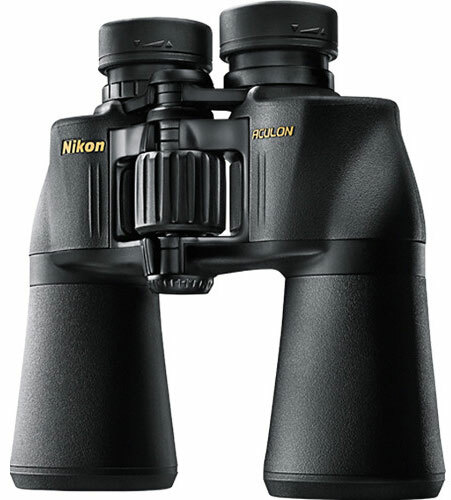 These very high quality, high powered binoculars from Nikon are a great option and possibly my favorite choice if you are looking for a binocular that can be hand held as well as attached to a tripod as they weigh just 1.2kg (43.5 oz). Whilst they only have 56mm objectives, they come with a host of very high end optical features to improve image quality and boost the brightness. This includes: Extra-low dispersion (ED) glass, phase corrected Bak-4 roof prisms that also have dielectric high-reflective coatings and all lenses and prisms are fully-multilayer-coated. The FOV on these is an impressive 174ft wide @ 1000 yards (58m @ 1000m), which is a lot better than many others with this amount of power. The Nikon 20x56 Monarch 5 binoculars cost about $850 - $900 in the US and £700 in the UK. 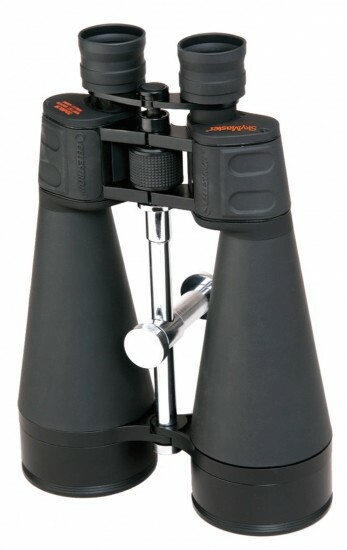 Giant high zoom binoculars, with objective lenses of around 80mm like some of those listed below are commonly used for astronomy as they have large objective lenses to let in as much of the little light that is available and have a high magnification to bring distant objects like the moon, stars and galaxies into closer view. However this does not mean that they can't be used as effectively as a terrestrial long distance binoculars. 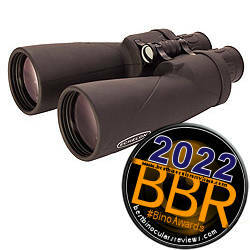 Winner of Binoculars.com's award for the Best Astronomy Binocular in 2012, the Zhumell 20x80 SuperGiant Binoculars are a pretty good option if you are looking of a cheap, but high powered binocular. Despite their giant 80mm objectives, they have kept the weight down to 70.4 oz. / 4.4 pounds / 2kg, making them just small enough to use in the field, but of course are best mounted to a tripod. They also feature fully multi-coated optics and BaK4 prisms, and custom adjustment with center and right diopter focus knobs. Perfect for lunar viewing, locating deep space objects, or as you need, long range terrestrial viewing. 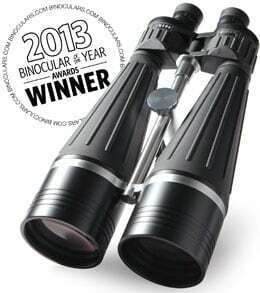 Zhumell SuperGiant 20x80 Binoculars cost about $100 in the US, but are a little harder to find in the UK. Like the Zhumell's above, these have a powerful 20x magnification combined with 80mm objective lenses to produce a 4mm exit pupil. The also use high quality BAK-4 prisms, but they only come with Multi-Coated optics as opposed to the Fully Multi-Coated ones on the Zhumell's. Having said that they are a fraction of the price when compared to high spec giant binoculars and will still produce a more than decent view during the day. Weighing 75 oz (2126 g), they have a FOV of 167 ft. at 1000 yards. 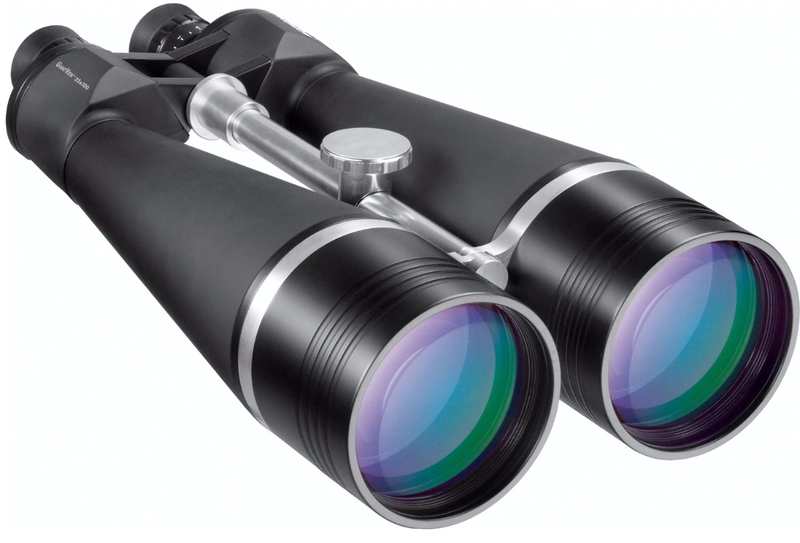 If you are looking for even more power a good mid-cost option would be these Super Giant Zhumell Tachyon binoculars with their massive 25x magnification and 100mm objective lenses that produce an exit pupil of 4mm. 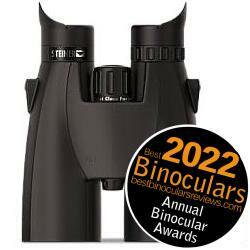 Winner of the award for the Best Astronomy Binocular in 2013 at Binoculars.com, the optics on the Tachyon include the use of BaK4 prisms and fully multi-coated lenses and they have a relatively wide FOV of 157 ft. @ 1000 yards. Their weight is 4.7kg (164.8 oz.) and so as you can see you will definitely be needing a tripod! Zhumell 25x100 Tachyon's cost about $240 in the US. The Barska 20x80 Cosmos uses BAK-4 prisms combined with fully multi-coated optics, and a large 80mm objective lens to allow for maximum light transmission and clear, crisp imaging. These fully waterproof, heavy-duty, binoculars are ideal for long-distance and astronomy viewing, they have a braced in tripod mounting post allows for quick and easy setup. Whilst these use a lightweight and high quality aluminium body, they still weigh 2.5kg (88 oz). Field of view is 157 ft. wide at 1000yards. I'm 70, still can't figure out the social platforms you mentioned - sorry. Absolutely love the web site. Clear, concise, good balance on color changes and fonts that old people can see. Pretty amazing. Hi Ryan, many thanks for your question and the kind words. Whilst I have not had the opportunity to test the Fujinon 12x60, I don't think you will go far wrong with them as I have heard only but good things about the brand in relation to long range, larger objective binoculars. 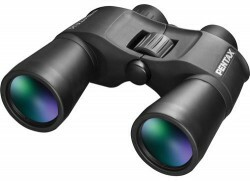 The only thing I have reviewed that is similar to these and which I may recommend are the Celestron Echelon 20x70 Binoculars (see above or Read My Full Review here), which are in my opinion excellent. However as you are planning on using your long distance binoculars mostly for night, I think you are right in keeping the magnification down to a reasonable amount, to maintain the exit pupil size. Whilst not the case for everyone, I think this is even more important when we consider your age, where your pupils may not dilate as much as when you were younger. For more on this please take time to read my complete guide to the exit pupil which goes over it all in detail. I hope this helps and I would love to know what you do eventually get and how they perform for you. Another option would be to get a spotting scope which are in their most basic form, telescopes designed for terrestrial observation. These generally have higher magnifications than even the strongest binoculars and come with larger objective lenses for the reasons that we have already discussed. The down side is that they only have one eye-piece (the are essentially half a binocular). 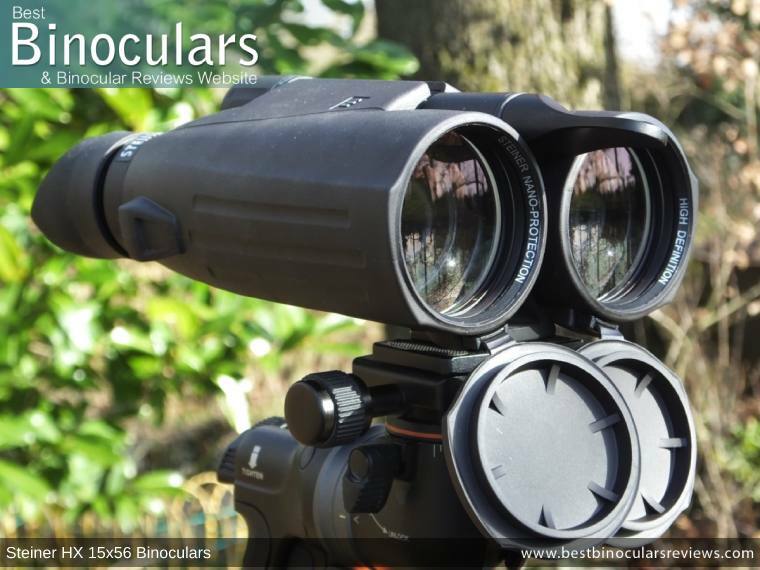 Whilst this saves weight and makes them smaller, but in general I feel that a good quality high power binocular is easy to use, provides a better view and to me offers improved comfort, especially during extended periods of use than most spotting scopes. If this option interests you, take a look at the Best Spotting Scope Reviews Website that includes much more information as well as reviews on a selection of spotting scopes that I have used. Sunagor 30-160x70 Mega Zoom Binoculars - I take a closer look at these super powerful zoom binoculars. I hope that at least some of the advice I have given is useful and that you are able to find the right long range binoculars for your needs and within your budget. If you or anyone else has any more questions related to this topic, please don't hesitate to ask it in the comments section at the bottom of this page. If you have a question relating to binoculars, or just want to know more about a specific technical optical term, then I would love to try and answer it for you. Submit your question here.